The azure sky with fleecy white clouds, the mild fragrance of shiuli, glimpses of fluttering kash in the fields herald the advent of Bengali's most popular festival, Durga Puja. The tale prevalent with regards to Durga puja is - a demon namedMahishasura became almost invincible because of a boon granted to him by LordBrahma (the Creator in the Hindu Holy Trinity of Creator-Preserver-Destroyer) whereby no male could defeat him. But the gods found an innovative solution to the menacing problem, the amalgamation of the strength of all the gods resulted in the birth of Goddess Durga an incarnation of Shakti (divine power), who, with an assortment of weapons in her 10 hands vanquished and killed the demon, thus ending his reign of terror. This holy battle has come to imply the triumph of good over evil. October 9th, when mellow sun treaded softly in Bengal landscape, thousands of miles away in Brussels, Belgium a group of nine ardent Bengalis and one Dutch hit the road to participate in the spirit of excited festivity in Cologne Germany (biggest Durga Puja in Europe). The fervor was indeed ardent as it was a perfect integration of diverse faiths in the group of ten - Hindu, Muslim and Christian. 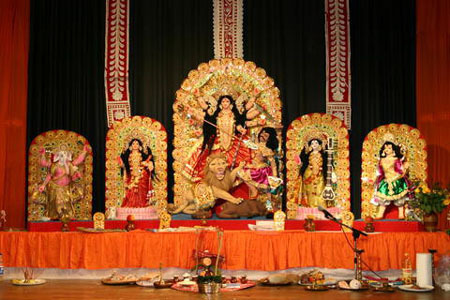 Nevertheless, Durga Puja, over the years, has outgrown its religious nuance especially in abroad. It was almost four hours drive to Winen (Germany) where we had rented a house for three days. The owner, John's, warm welcome had made the quaint house inviting. To formally embark on the festivity mood we had a barbecue lunch and soon after we decked up to go to Puja hall. Maha Shashthi (sixth day) the priest unveils the deity known as bodhan. Camphor, and sandalwood paste smell wafting through; the deep sound of conch shell, the rhythmic beat of dhak (traditional drum) mingled with Sanskrit shlokas (religious couplets), greeted us. We entered a chock-a-block auditorium. There was no entrance fee, just a voluntary donation to appreciate the mammoth job undertaken by the Bengali Diaspora of Cologne. The doe-eyed deities were housed in resplendent glory and the whole arena was painstakingly decorated by the volunteers. As it was a Sunday, the arena was packed with jostling worshippers who had come from afar to catch a glimpse of Ma and obtain her blessings. We surfaced little late for bodhon, but prompt enough to see the kaleidoscope of brilliant recital given by professional dancers. This was followed by a splendid dinner courtesy the Cologne Puja Committee. The anointing bath given to kolabou (banana plant worshipped for prosperous harvest) inaugurated the morning of Maha Saptami (seventh day) followed byanjali (prayer). Unlike the weekend package puja affair of USA, Cologne puja dotes on timing of the puja procedure. Irrefutably the morning to afternoon of weekday puja found a handful of zealous worshippers like us trying to befriend with anyone upon sighted. And come evening, the not so packed arena was transported to a dazzling array of new clothes and shiny faces. The festive spirit at times was very hilarious and palpable- women, both Indian and German, draped in traditional saris and embellished with chunky ornaments, vociferously prattling in German, concurrently thakur moshai (priest) was chanting prayers in Sanskrit very solemnly. The very respectable thakur moshai (priest), split a second chantingslokas (religious couplets), was impeccably dressed in black, smoking out his tiredness. His only identification was the flower tied to a strand of his hair- well, we call it a tiki. Undeniably, it was the lure of gala dinner that kept the people perched on to see the cultural event. The Maha Ashtami (eighth day) is always the culminating point and apparently momentous. All of us (women crowd) had draped white sari with red border, men dressed in Kurta pyjamas (traditional attire) ' an impressive combination. Most of us had fasted and so after morning anjali (prayer) we literally scraped the bhog(food offered to deities) plates. Cologne is also famous for the cathedral, one of the relics that survived the brutality of World War II. Afternoon we all went out to delight our eyes with the wonderful dome at the bank of Rhine River. I must mention that our attire had raised a number of inquisitive yet friendly eyebrows. The auspicious evening was marked by sandhi puja (evening puja) wherein 108 lamps were lighted simultaneously with slokas (religious couplets) .The eveningarati (lamplight worship) with rhythmic beats of dhak (traditional drum) , the emblematic smell- all of us were, at that juncture, reminiscing the time we had spent in Kolkata puja. A sumptuous Chinese dinner treat bounced us back to our gleeful mood. We shoved off early that night and ended up with a Uno session. Biding farewell to John, we reached the Puja hall for Maha Nabami (ninth day) puja. By this time we got introduced to some of the high-flying members of the puja committee and they left no stone unturned to make us feel at home. We had a sketchy idea about the amount of work being done at the background to stage the puja conforming to the environmental factors; we could fathom it only after one of the members took us to sneak a look at the kitchen. We were all admiringly astounded to see so many volunteers relentlessly working to make our dreams, to celebrate Durga Puja way off from Kolkata, come true. Customarily Maha Dasami (tenth day) is the next day but this year it merged with nabami. The solemnity of the occasion of dasami, marking the end of puja, was wrecked by the playful ritual called sindoor khela during which women smeared each other's forehead and faces with vermilion powder- a worthy spectacle of the riot of vermillion. We wished all, known and unknown, Subho Bijoya (greetings). After the stunning cultural program we satiated ourselves with the mouth watering dinner. At 9:30 pm we headed back to Brussels with a contented heart that silently pledged to revisit 2006 Durga Puja. 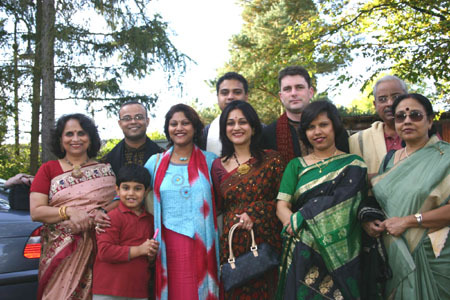 Anar Chowdhury, Rajeeb Chowdhury, Rajat Chowdhury, Jayati Chowdhury, Anis Chakravarty, Rumeli Chakravarty, Alex Schriver, Bidisha Chakraborty Schrive, Dhrubesh Chakravarty, Anubha Chakravarty. I might be posted in Cologne soon with my wife & 10 yrs. old son. While browsing for Indian/ Bengali communities in Cologne, I came across this website. Is it possible that you know somebody in Cologne who can help us relocating- of course my office would do that. But, an Indian/ Bengali would be a big plus!